Merry Christmas! Not that far away now and I’m getting ultra excited; I love visiting packed stores to be given abominable customer service by under-qualified and brain-dead Christmas temps. Anyway… here’s something lovely from Kiehl’s to lift our spirits. 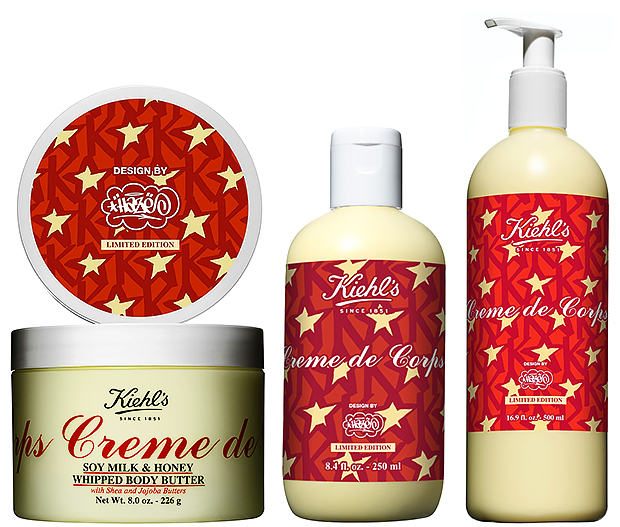 This year Kiehl’s have had the Creme de Corps limited edition collection designed by New York graffiti artist Eric Haze! If you’re unfamiliar with Creme de Corps, it’s a gorgeous, stunning, superb and just fabulous body moisturiser from Kiehl’s and is unparalleled on so many levels. With a deliciously light and buttery scent and formulated with Beta-Carotene, Squalane and nurturing oils; it melts into the skin without leaving you feeling greasy or sticking to your body hair and can be used all over (except the face). As well as Creme de Corps, there’s also a limited edition Ultra Facial Cream designed by Haze as well with prices starting from £24 here at Kiehl’s online. This article first appeared on MANFACE written by Thom Watson. It was published on Saturday 7th December 2013 and was last updated on Monday 3rd April 2017 at 3:21pm. It's categorised under Body, Kiehls, Moisturise where you'll find more related content.